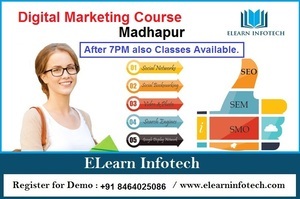 Elearn Infotech is one of the Top Digital Marketing Training Institution for Digital Marketing Training (SEO, SEM , SMO and SMM), which is located in Madhapur, Hyderabad. We have 6+ years Experienced Digital Marketing Traininers. We offering Digital Marketing Training in Madhapur Hyderabad with Live Projects. Register for Free Demo Class Today.